Or what could be more appropriately titled as "trying not to buy more food till we move the fridge" bento! Despite the lack of actual food, we managed a fairly simple, but yummy lunch during our move, and used out a few need-to-use items in our old-house fridge! I'm not entirely sure which kid took this lunch, my guess is Ben, based on the colors on the colors of the circle picks. Either way, they both had the exact same thing--crackers, rolled up deli turkey, a wedge of Laughing Cow cheese, some pieces of sliced cheese, carrots and cantaloupe. Included, but not pictured, were yogurt, applesauce and a granola bar. Their charter school offers ample snack times which the kids are fond of taking advantage of. 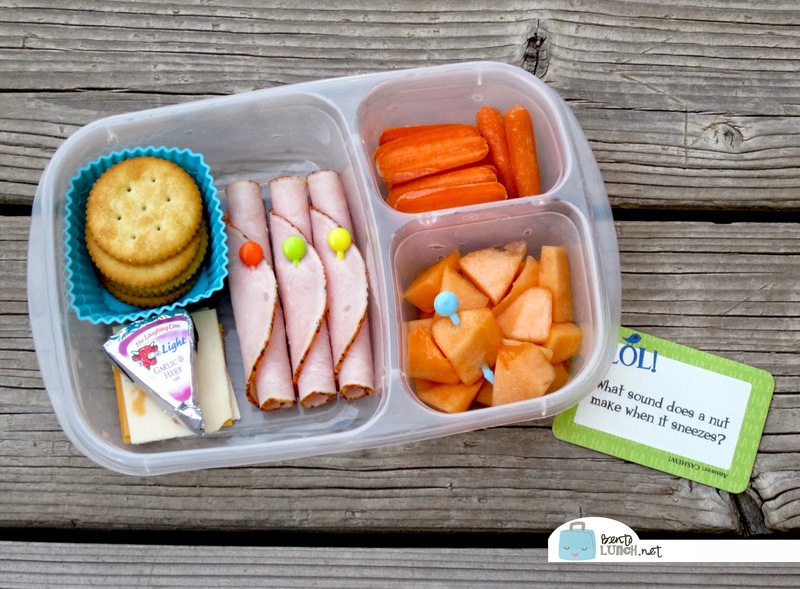 Our not-so-fancy lunch was packed in our Easy Lunchboxes (thank God for those and being dishwasher safe!) and included a Lunchbox Love note.